Remus was supposed to be a great champion. I have heard of his shield. Some say it was locked away in a treasure somewhere in Oceanus Hesperos. Seek out treasure and you should find the story of Remus. I laugh aloud for the thing you seek...Find it on an island meek. Though quiet and alone it seems...Danger will pervade your dreams. Seek amongst the treasure holds, I hope you find your weight in gold. If not your bleached bones will sing...Of days when you were a living thing. What greater thing in life can there be than sport and contest? What greater joy is there next to finishing the trials in victory? I know not one thing. Not even Remus, friend and fool of mine, could find any greater joy. I know no one who has completed the trials more times than Remus. He was bored after the army. "How many lands could one conquer," he often asked. It was true of him, as well. No land ever stood before us. So many has been taken, and so many was Remus a part of. "There was no challenge," Remus lamented. "They see us, we have a short fight, and they give us all. But sport, well, none admit defeat in contest, for all who show up only want victory. So to the trials," said Remus. "Enough of the easy ways of life," he said. "A challenge, we all need a challenge." Remus, the fool, ever so boastful. His father was of a like mind. I remember the challenge thrown by him. The laughter in the hall rang louder than the calls for drink. "None is greater at sport than my son," he cried. "Ah," laughed my father. "You would have us believe Remus is that good? Ha! You would have us think he could do the trials with one arm tied round his back!" We all laughed. Even Remus found it humorous. But as we laughed, we caught a look in his father's eye. It gave us both pause. "'Ah, old friend, but he could do the trials with one arm tied round his back." The hall was silenced. What a boast! In the silence Remus looked at me, and turned to face his father, standing speechless in a hall full of stares. "Done," he cried. "One hand tied round my back." I pulled him close. "Remus," I said, "You are mad." "Yes," he replied. "But worse than mad, my friend. I am bored." Bored! Remus was bored! And so for that reason alone Remus risked life and every limb and welcomed me along for the fun of watching him, and as a witness that indeed, his arm was tied behind his back every moment of the trials. Well, it was quite a thing to witness. Ah to have that skill, or be it luck. Sometimes it was comical, I couldn't stop laughing at the image he cast fighting many of these creatures off with merely one hand, barely keeping his balance at times. More often than not, I held my breath for fear that he finally had taken on a task too great, one that would be the end of him. But, in the end, Remus, one arm tied round his back, prevailed. That was a spectacle! When he determined his victory, he leapt about with such zeal he forgot one arm was still tied, and losing his balance, tumbled down a hill! Such a victory cry I'll never forget, for never before has my name been yelled in the final moments of victory! Ah so then the return to his boastful father, my father, and the hall of disbelieving champions and warriors, all, like me, thinking Remus a fool for accepting his father's foolish boast. But was it well worth it, in the end, I asked Remus, for now, accomplishing this, would he not still suffer boredom? What else could he do? "It matters not," he said. "For no other can say they have done what I have just done!" So we returned home, and Remus received great praise. But his father, either in pride or abashment at having made such a drunken boast of his son, had a gift worthy of a king waiting for Remus. It was a shield like none I have ever seen. The greatest smiths were hired, and the craftsmanship of the shield was without rival. It was named Aten, and was the image of a golden sun. When Remus held it up, indeed, it looked like he was holding the sun itself up, and it shone brightly in the room, as though its rays were not mere glints off the golden shield. And this was Remus' shield. Oh the legends they made of this shield! "Remus is invincible so long as he holds this shield," they said. "Oh," others said, "none are that powerful." "No, Remus is invincible so long as he holds this shield by day," they said. "For that is not too powerful." "Every man has a weakness. Remus' weakness is only at night." "Oh but even then," others proclaimed, "even then, his shield lights up the darkness, bringing daylight to night, as if in absence of the day's sun, it must take up the task on its own." Ah. The fools they are. But Remus did take a lot of pleasure in these stories. And now, here I am, in the planes, wielding Remus' shield myself, and how I wish even a mere hint of the legends were true! Still, it was good of Remus to lend me the shield. But I am a fool in my old age as Remus was a fool in our youth. But I am not content to suffer my final days in illness. No, I would die in sport or contest. Not in a sick bed. "Take Aten, my old friend," said Remus. "I can not go with you, but I can not leave you without my friendship, so Aten is yours." Ah, so Remus, my old friend, would have me die with his greatest prize, to be buried here in the trials with my weapon and his shield. Truly a hero's burial. I will miss old Remus. Note: Scholar Ashton refers to this as [Remus Shield] but this does not trigger Sphinx Callia to speak. 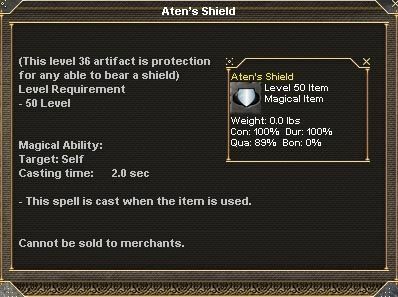 You have to "/say aten's shield" to get her to tell you of the riddle. Champion's Notes are the scrolls that go to this artifact. Note that Scholar Ashston says Remus was a great "Champion." They are clearly both one and the same artifact. The story here is what you get when you /interact with the combined scrolls.